I'm not sure why I hadn't ever stopped in the Santa Inez Valley on my way up Highway 101, but I suspect it had something to do with the presence of restless children packed into the backseat among loads of camping gear, and the need to get to Big Sur by sundown. 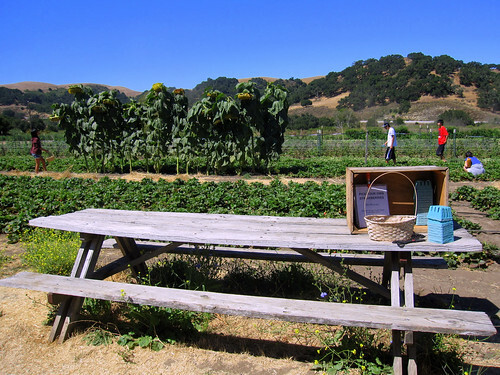 Last week I skipped the annual Big Sur camping trip for a closer weekend in Los Alamos, Solvang and Los Olivos, and it's really one of the best close-by getaways there is -- especially if you like wine. Here's some worthy stops between Santa Barbara and Los Alamos. In Santa Barbara, nearly everyone in town was in line at La Super Rica. I've been there a zillion times, so we tried Lilly's instead. Lilly's is a very basic taco place hard by the 101, with a specialty in more obscure cow parts like lip, head and eye. Matt braved the tacos de ojos ($1.40 each, bottom in photo) -- "a little slimy, not bad with salsa," he reported, while I enjoyed the pork adobada. Lilly's isn't much different from eating in Highland Park, but it's probably the only place in Santa Barbara to eat for $3.00 and makes an easy lunch stop. We stayed at the Skyview Motel in Los Alamos -- it's pretty basic, but super reasonably-priced and has a pool, rec room with a pool table, generous free breakfast on weekends and it's walking distance from Full of Life Flatbread, the main attraction in tiny Los Alamos. 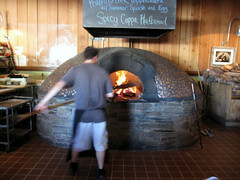 It's only open for dinner on weekends, but Full of Life is well worth a stop for its flatbread pizzas cooked in a giant woodburning oven. There's plenty of outdoor seating or toasty tables near the oven indoors, and the restaurant has an excellent local wine and beer list. 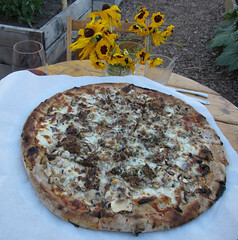 We ate in the middle of the restaurant's garden, ordering Santa Barbara squid roasted in the oven and a salad from the restaurant's garden along with a Central Coast sausage and cheese flatbread. The thin, chewy flatbread uses coarsely-milled organic flour for an extremely flavorful crust marked with browned bubbles. The next day we explored the beautiful area around Los Olivos, Solvang and Lompoc. In Los Olivos, you can get a tri-tip sandwich at the Los Olivos Grocery or pick up picnic supplies for later. 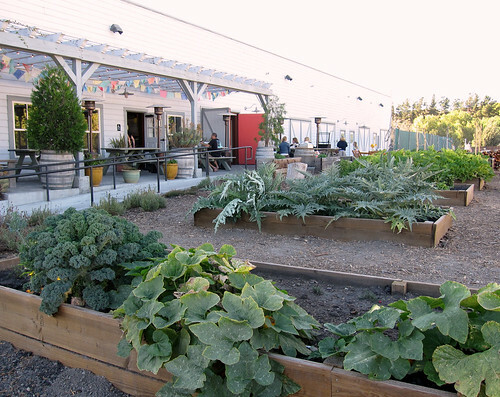 We stopped in at the Carhartt tasting room -- the tasting room is tiny, but a shady garden out back accommodates several more people, and it was lovely relaxing by the fishpond while winemaker Brooke poured samples. 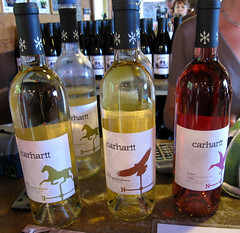 The $10 tasting fee was waived because I just had to pick up a bottle of the Pinot Noir and one of the rose. 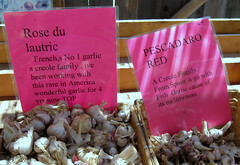 In Los Olivos, don't miss Homegrown Garlic on the main drag, a stand where Paul Poulmer grows and sells over 60 varieties of garlic. We choose Rose du Lautric and Belarus varieties to take home. 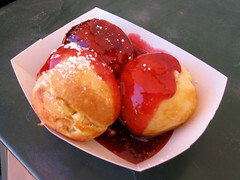 Solvang was hot and touristy, but we made a quick stop for Danish aebleskivers, the freshly-made cross between a donut and a pancake that are irresistible with raspberry jam. It was there I invented a new rule for trips: When you see a local specialty being made on the street or served through a window on the sidewalk, it's always best to try it, or you'll be thinking about it the rest of the trip. We didn't stop at the ostrich farm in Solvang, but it might be a fun stop if you've got kids or want to buy some ostrich eggs or meat. Alma Rosa Winery feels like it's in deep countryside, but it's really just a few miles outside of Buellton on the way to Lompoc. 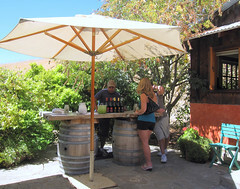 The winery is owned by Richard and Thekla Sanford, who started one of the very first wineries in the area back in 1981. They're now producing all organic wines at Alma Rosa, where the rustic tasting room and patio seems far removed from noisy L.A.
On the way home, we stopped at Classic Organic in Goleta, a wonderful farm stand with pick-your-own strawberries, uber-fresh eggs in every pastel shade and lots of other fruits and vegetables. The strawberry I stole from a sun-warmed plant was probably the best I've ever had, and I was glad to have the organic eggs when I returned home to find out my Trader Joe's eggs had to be trashed due to the recall. Whether you go to taste wine or just check out the garlic and flatbread, the Santa Inez valley is really close and fun to visit. This trip sounds AMAZING. I'll have to try it! Thank you!